Commodity Trading News And Technical Analysis Reports. Base Metals Aluminium, Copper, Lead, Nickel, Zinc. Bullion Gold, Silver. Energy Crude Oil, NG. 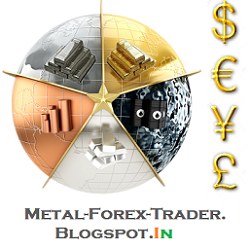 Forex USD, INR, Euro, Yuan. Economic Data Reports. LME, COMEX, NYMEX, MCX, Shanghai Markets. "After several weeks, Gold is setting up for a sell, US Treasuries are set to resume their bear trend, and the USD is set to resume its bull trend. Get ready..." is the ominous warning BofAML's Macneil Curry sets forth in his technical treatise this weekend. Despite the plethora reasons for rates to go lower for longer (and treacherous market conditions expected ahead) and the various fundamental and technical drivers of recent precious metals strength, Curry says it's time. Over the course of the past several weeks, some of our core views and themes have fallen into short term corrective mode. Specifically, we are referring to our bearish US Treasury view and our bullish US $ view (most notably against €, CHF and many EMFX, as well as gold and silver). In the week ahead, we look for these trends to re-emerge and do so in a manner that should provide some excellent low risk, high reward trade setups. Beginning with US Treasuries, we likely look to sell 10yr notes into the 2.53%/2.49% zone for the Apr-04 highs at 2.82% and beyond. In FX, we will likely look to re-initiate €/$ shorts into the 1.3676/3735 zone for a resumption of its medium, potentially long term bear trend and in $/ZAR we will likely look to re-buy near the 50d (10.5357) for a resumption of its long term bull trend and new 2014 highs (now 11.3915). Finally, gold is fast approaching the 1334/72 topping zone from which we look for significant weakness to and through 2013 lows at 1180. In our view, the bear trend is about to resume. Intra-day charts say the 2wk consolidation is in its final stages. We will likely look to sell one last push lower, ideally to 2.53%/2.49%, for a resumption of the larger bull trend to 2.82% & beyond. In last week’s KrystalBull we wrote that “the medium term trend has turned higher” for gold but that “gold bulls should not get too enthusiastic. AT BEST, we think it can reach the 1334/1374 area (measured move and yearlong contracting range highs) before topping and substantial weakness”. The strength of last week’s move caught us off guard and says that the 1334/1374 topping zone could be reached much more quickly than anticipated. We will look to go short into this zone. As can be seen from the chart below, gold is close to resuming its almost 3yr downtrend after a year of consolidation, with targets seen for a test and break of the 2013 lows at 1180. Thought For A Day - No tags for this post. The post Thought For A Day appeared first on Anirudh Sethi Report. Base Metal Prices to Diverge, SMM Says - Base metal prices on the SHFE are expected to diverge on Tuesday, Shanghai Metals Market foresees. Nalco plans to raise aluminium output. It's Never Different This Time - 1987 or 2014? Live Economic Calendar powered by Investing.com, the leading financial portal.